Ardingly College are pleased to be able to offer a number of scholarships and awards across different disciplines. They are awarded on the basis of examination, interview and, in the case of Music, Drama and Sport; audition and assessment. 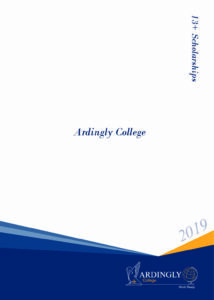 All scholarships and awards for entry to Ardingly College at 13+ and 16+ years can be supplemented by a means-tested Bursary Award. If you wish to apply for a bursary, we will provide further details once a scholarship has been offered.